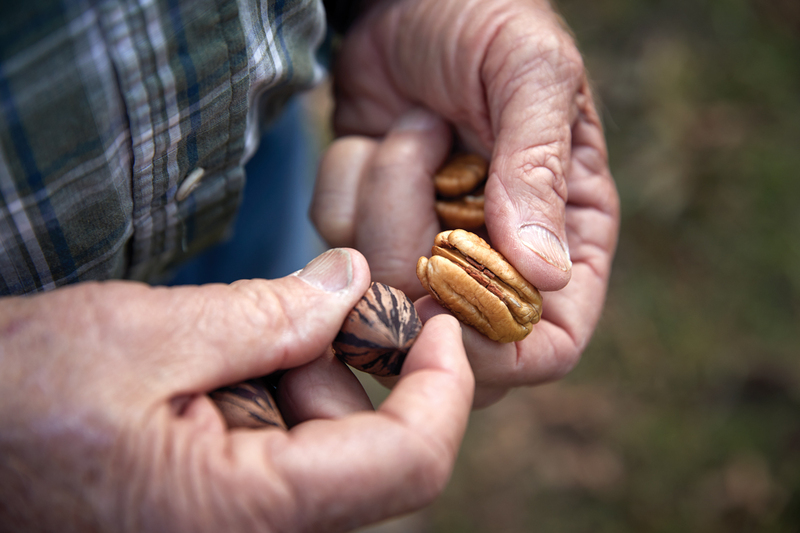 Georgia pecan farmers have thrived for a century. After Hurricane Michael, they’re unsure if they’ll survive another generation. Robert Cohen, who’s been harvesting pecans since he was a boy, kneels next to the wreckage of one of his trees. Late in the afternoon, if Robert Cohen was sitting on his patio, he could glimpse the shadows of pecan trees. As a young boy, he had learned to shake nuts from their long, elegant limbs. As a man, he had passed down the secrets of their harvest to his two sons, a tradition so sacred that it took precedence over high school football. Eventually, his sons took what he taught them and planted even larger groves. Now, at 75, the farmer rocked in his chair, thinking about the pecan trees and wondering how many more Cohens might flourish under the shadows of giants. On October 10, 2018, as the afternoon sky darkened, Cohen lost sight of the shadows. A few hours earlier, Hurricane Michael had crashed into the Florida coast, nearly 100 miles away from where he lived in Brinson, as far southwest as one can go in Georgia. In the days before Michael, one meteorologist had forecasted gusts of 50 miles per hour reaching the area. Another predicted winds twice as strong. Cohen had lived in this 200-person town since World War II. Triple-digit hurricane winds? In Brinson? It seemed impossible. He didn’t evacuate. Nor did he board up the windows of his two-story home. Nor did he worry about his pecans, just 10 days shy of harvest. Worrying couldn’t change the weather. After five decades of selling farm supplies, years in which he grew pecans on the side, Cohen wanted nothing but to tend pecan trees for the rest of his days. As the Category 4 hurricane barreled from Panama City Beach to Brinson, he sat outside on his rocking chair for as long he could, unaware of its trail of death and destruction. He watched the pecan shucks get ripped from their limbs. Then, the limbs snapped off the trees. Finally, the winds uprooted the trees as effortlessly as a gardener pulling carrots from the ground. Around 5:45 p.m., Cohen sought shelter inside with his wife in their den. The walls of the house shook. The winds howled like a runaway train. All he could do was pray that some of the trees would be spared. When Cohen emerged the next morning, fallen trees had rendered the roads impassable. A large limb rested beside his unharmed pickup—a reminder that the damage, as bad as it was, could’ve been worse. After checking in with his sons, he and his wife steered an off-road vehicle through the debris, looking for a way into his main orchard. They wove the cart through the mess for about a mile down the road. Then, they spotted an opening. He slowed the cart, hoping not to crush pecans that might still be saved. Once Cohen reached the clearing, he saw rows of baby pecan trees still standing. Planted in 2017 after Hurricane Irma, they were still too young to bear nuts. It was a small victory. When he looked into the distance, his oldest trees—some more than a century old—lay lifeless on the ground. His wife started crying. If crying could do any good, he would have shed tears, too. Tears couldn’t get those roots back into the red clay. Tears couldn’t deliver his dream of a peaceful retirement. The Cohens wouldn’t just be wiped out this harvest. They would lose the harvests of many seasons to come. 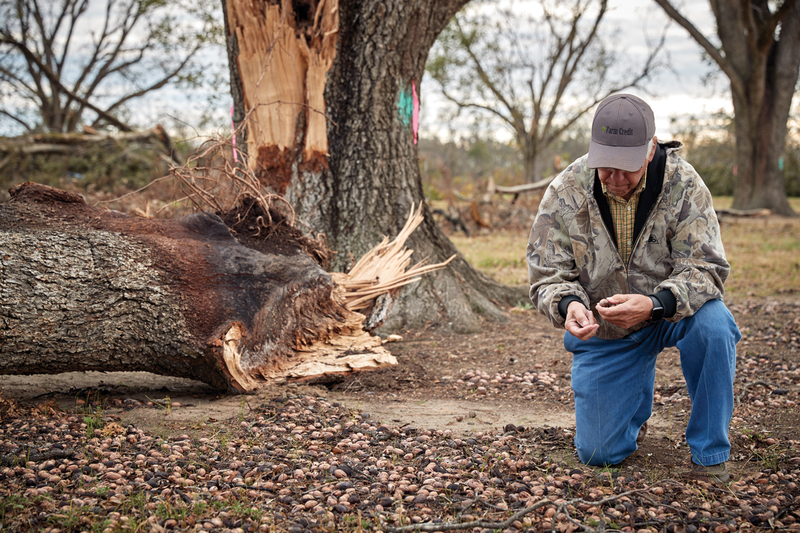 Roy Goodson inspects pecans after Hurricane Michael, the worst storm he’s experienced in 50 years as a farmer. Damage to a generational crop, pecan farmer Bo Morey explained, has generational consequences. The 2018 crop was shaping up to be one of the best harvests his father, Tyron, had seen in half a century of farming. They had just started to shake nuts off some of their trees, mostly a variety that matured early enough to sell for Thanksgiving and Christmas, and had collected 2 percent of their total crop when Michael arrived. Within hours, they lost a quarter of their trees spread across 1,000 acres. At Bo Morey’s insistence, I climbed to the top of a massive red dumpster on the outskirts of their orchard. When I peered over the edge, I saw thousands of pounds of pecans piled inside. These nuts, which had started to blacken, were the first of many destined for the trash. The story of the Georgia pecan took root just after the Civil War, when a handful of farmers from Chatham to Chattooga counties experimented with growing the sweet, buttery nuts. Around the turn of the 20th century, real estate developers sold thousands of acres of pecan trees near Albany, marketing small farms that went for upward of $1,000 an acre. (A 1900 Atlanta Constitution article headlined “Georgia Pecans: Lots of Money in Them” was nationally syndicated.) President Jimmy Carter, best known for farming peanuts (technically a legume, not a nut), spent his childhood shaking pecans from the trees his mother grew on the family farm. As Georgia farmers embraced new techniques from processing to grafting—in which growers joined a bud with a rootstock to produce higher-yielding varieties that proved resistant to disease—they helped turn local pecans into a national phenomenon. In the 1930s, Georgia pecan pie recipes appeared in newspapers across the country. In 1948, the Georgia Pecan Growers Association convinced General Anthony Clement “Nuts” McAuliffe to shower pecans over Bastogne, Belgium, in commemoration of the Battle of the Bulge. Half a century later, the Georgia nut had grown so iconic that organizers for the 1996 Olympics crafted Muhammad Ali’s torch handle out of pecan wood. In 2015, Georgia farmers produced 37 percent of pecans grown in the U.S., a nation responsible for roughly half of the world’s production. 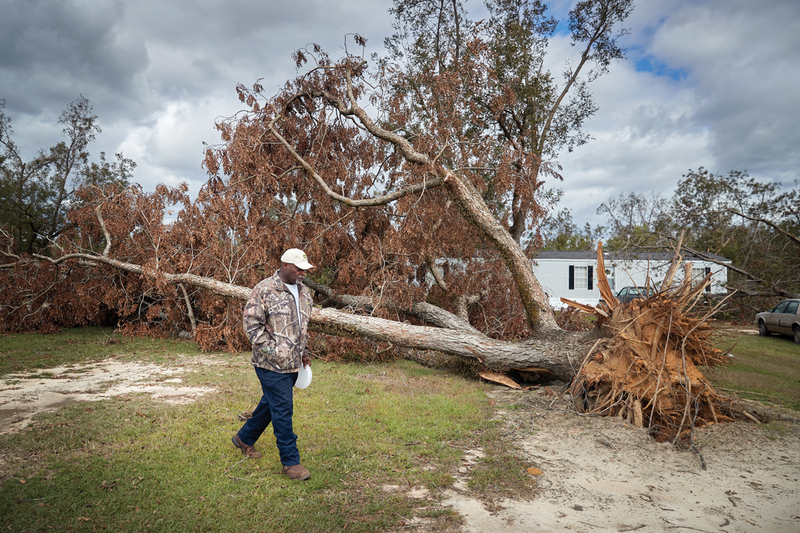 Many agricultural crops that sustained major Hurricane Michael damage can be replanted next year so long as growers can withstand the short-term financial losses. Richard Merritt, a pecan grower in Weston, noted that nearly a decade must pass for new trees to fully mature. Pecan nurseries already had waiting lists before Michael. Given that Georgia lost a sixth of its total pecan trees in the storm, farmers are faced with a long road to recovery. Henry Ward Jr., a third-generation pecan farmer, will soon find out if this year’s crop is a total loss. At an orchard in Baconton, eight days after the storm, 53-year-old farmer Henry Ward Jr. was still waiting for power to be restored. As Ward carefully made his way past the fallen trees behind his double-wide, trying not to crush any nuts, he reached up to one of his younger trees to grab a green shuck that had yet to fully split open. He explained that the pecan variety inside the shuck, Cape Fear, typically opens later in the fall. Because so many were on the ground, still closed inside a shuck, they’ll be extremely difficult to open—though many might be salvageable. But he’s not supposed to touch the fallen ones that are scattered across the nearly 100 acres he farms. He was waiting on an insurance adjuster to tell him whether he should write off this year’s crop as a total loss. “I’m at a standstill,” Ward said. In 2012, a tornado downed some of their trees. Michael was worse. Staring at a fallen tree his grandfather had planted, Ward knew that the hurricane had brought another level of destruction. He said it now will be difficult, if not impossible, to ever quit his factory job. Other small-time farmers who depended on pecans, he said, might have no choice but to sell their land. He admitted that, at times, he’s reluctantly asked himself: Should I still be harvesting pecans? He’s considered diversifying into peaches, plums, or nectarines—but all those are grown from trees, too. After such moments of doubt, he remembers everything he lost after his father’s death, and the thought of leaving pecans behind fades fast. He’s now determined to fight the aftereffects of Michael. 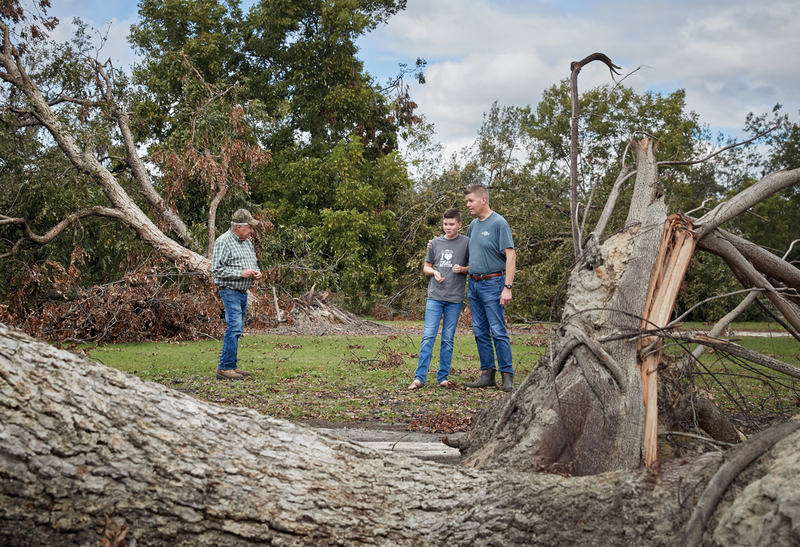 A pecan tree uprooted by Hurricane Michael underscores the challenges farmer Henry Ward Jr. faces. The president of Georgia’s largest pecan growers’ association, Brinkley said farmers recuperating from the trio of recent hurricanes—Matthew in 2016, Irma in 2017, Michael in 2018—hope federal and state relief will save their businesses. But he believes another threat, the U.S.-China trade war, will complicate their long-term recovery. A former executive in the diaper business, Brinkley first tried his hand at pecan farming in the mid-2000s. As he tells it, there had never been a better time to become a Georgia pecan farmer: Chinese people were falling in love with pecans—cracking open shells the way Americans often do with peanuts—and quickly became one of the largest importers of the state’s nuts. As Chinese imports surged, the price of Georgia pecans doubled between 2005 and 2011, a rare economic bright spot during the Great Recession. Hoping to capitalize on the pecan boom, Brinkley expanded his holdings to 600 acres. He considered the farm a safer bet than the stock market for his retirement fund. But his 600 acres, which cost $7,000 an acre to plant, no longer seem as safe an investment. Eric Cohen, one of Robert Cohen’s sons, also expanded his holdings from 45 acres to 1,400 acres during the same period. “The farming economy didn’t go down during the recession,” Cohen said. “We were rolling. We were booming.” The boom mostly continued through 2015, when China cut U.S. pecan tariffs from 24 percent to 10 percent. While Irma set some farmers back, promising news followed the storm: China again lowered the tariff, to 7 percent. However, in the first half of 2018, President Trump’s escalating trade war with China drove up pecan tariffs to 47 percent. Some Georgia farmers, who typically sold more than half their pecans to China, no longer saw offers from those buyers. Unlike soybean farmers, who received a $6 billion bailout to withstand the trade war, pecan growers were instead given the option to sell surplus crops to the federal government, which would distribute pecans to U.S. food banks. 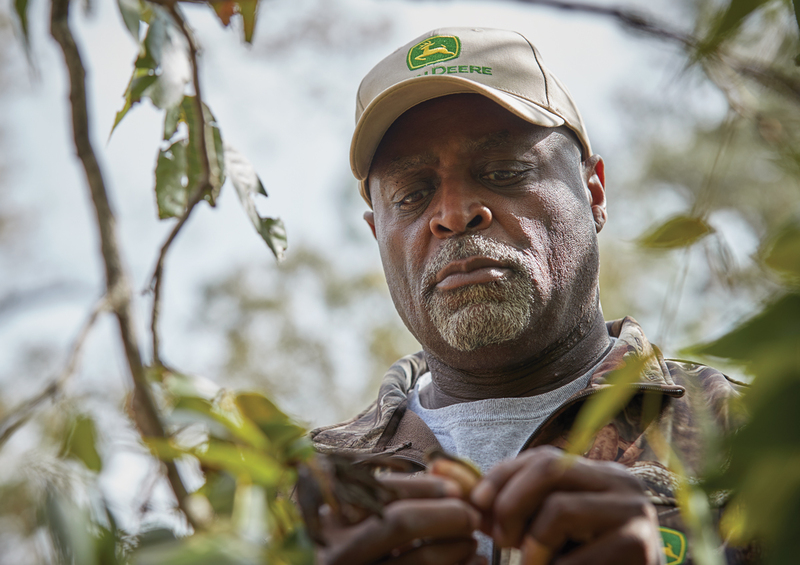 Three generations of the Goodson family consider the future of their livelihood. Late one Thursday in October, Drew Goodson walked a few paces behind his grandfather, Roy, intently studying his reaction to a disaster unlike any he’d seen in nearly a half-century as a pecan farmer. Earlier that afternoon, the lanky 13-year-old had watched his grandfather fix a heavy piece of machinery to help clean up after Michael. Now, in the golden light before dusk, three generations of Goodsons stood together under the most resilient of the limbs. When Drew’s father, David, first left Leesburg, Georgia, back in the mid-’90s, he had no desire to join the family business. Unlike Roy, David hated picking nuts and branches off the orchard floor. He wanted to preach the Lord’s word. With his father’s blessing, David went to college, studied scripture, and became a minister who served various Southern congregations. But as David grew older and became a father himself, he was pulled back home in 2010 to help Roy. David and his wife, Melody, created a line of products—pecan butter, pecan brittle, chocolate-coated pecans—that Drew now helps sell at farmers markets and festivals. Last spring, David brought Drew along to meet Governor Nathan Deal after winning a statewide contest for locally grown food products. Ten miles north of Albany, Michael destroyed a fifth of the Goodsons’ pecan trees. As Drew stared down toward the fallen limbs, he tucked his hands into his jeans, hunching over slightly, just as his father does. David has been mindful of letting Drew find his own path and is well aware that fewer people are choosing farming as a profession. (The average age of a Georgia farmer is 60.) He’s had to occasionally pull Drew, who’s actively involved in swim club, away from extracurricular activities to help with harvests. The latest pecan boom—and the high demand and prices that followed—showed Drew how his family’s hard work and sacrifices can pay off. Michael then showed him how tenuous life as a farmer can be. After a while, Drew looked up from the limbs, again catching sight of Roy, who’s determined to salvage whatever remains of his crop, regardless of whether it’s enough to break even. His grandfather had bent down to grab a fallen nut. Following his lead, Drew picked up a shell, cracked it with his bare hands, and pulled out the raw pecan. The bite he took was a taste of what was lost, and of the harvests to come. This article appears in our January 2019 issue. Georgia’s Vanishing Coast: With stronger storms, higher tides, and rising sea levels, how high will the water go?